Quality pointing labs in Wisconsin. We strive to produce puppies that will be excellent hunting dogs, but most importantly be great family companions. Our dogs have a natural instinct to point, with proven pedigree’s. 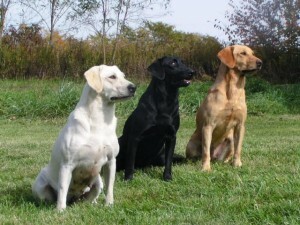 Our goal is to continually combine the best bloodlines in the Pointing Labrador community. We believe these efforts will guarantee superior quality in the dogs we produce for you and your family. Our breeding dogs are OFA Good or Excellent, OFA Normal Elbows, and have a current eye CERF. We have currently tested most of our dogs for EIC and CNM, and will continue this testing until we have completed all of the dogs. Please enjoy our website and looking at our dogs. If you would like more information or would like to speak with us, please feel free to contact us! Our Wisconsin Dog Seller License number is 272548-DS. CPR Zig Zags He’s a Big Dog-Doc Jr.